Just before the Legislature left for its summer break, lawmakers approved the education and general government budgets and sent them to the Governor for his signature. The final school aid budget, one section of the education omnibus budget bill that also covers community colleges and higher education, had a few important differences with the previous negotiated compromise. Unfortunately, it also includes several items added by the legislature though not wanted, or struck out, in the governor's original request. The education omnibus bill for the 2018 fiscal year (HB 4313 H-1 CR-1 ) increases overall spending on K-12 education by about 3 percent, despite a $92 million cut in anticipated Federal aid. Even so, more of the earmarked School Aid Fund was spent on community colleges than last year - around $200 million more, meaning virtually the entire $400 million state community college budget is now being paid out of the School Aid Fund, which had once been used only for K-12 education. Some $238 million of SAF funding will also go toward the higher education budget to support state universities, similar to the last few budgets. All told, School Aid Fund spending on community colleges and state universities, which used to be supported solely from the state's general fund, amounts to over $428 per pupil, if spread evenly over Michigan's projected 1.49 million public school students next year. That's several times the increase any district will receive next year. Total K-12 spending is about $270 million higher than in earlier draft budgets, but the contribution from the state general fund did not change (which is a cut from the current year). All school districts and charters will see an increase in regular funding of between $60 and $120 per pupil using the 2x formula, the same as the earlier compromise conference report. This means the new minimum foundation allowance will be $7,631 per pupil, and the state guaranteed maximum will be $8,289. As the attached charts show, the majority of Michigan students will receive a meaningful increase when all budget provisions are taken into account. Approximately 70% of all students attend districts which will receive a funding increase at or above the estimated rate of inflation (2.29%), though that means almost a third will not. The impact on low income students is broadly more positive. Charter schools on average get larger increases than local districts, though in part that is because many are located in high-poverty areas and benefit from other budget changes. In what is probably the most significant change for next year, the final conference report accepts a version of Gov. Snyder's proposal to significantly expand so-called "at risk" (Sec. 31a) funding, which helps districts cover the extra needs of children living in poverty. The final budget increases total spending to almost $500 million, an increase of $120 million over the current year. This level of funding brings the program much closer to fully funding the initiative, which has in the past always received appropriations that fall short of the statutory promise to districts. Among the important changes to this program, which allocates funds to districts per eligible pupil, is an expansion of which pupils qualify for funding. In the past, only students receiving Federal free lunch qualified. Now, all students considered "economically disadvantaged" will qualify, including both free and reduced-price lunch recipients and some special categories of students who automatically qualify for free lunch under Federal law (homeless, in families receiving SNAP or TANF public assistance, in foster care, or from migrant families). Also changed was the funding formula: the law used to specify that districts and charters would receive a certain percentage of their foundation allowance (regular per-pupil funding) for each eligible student. 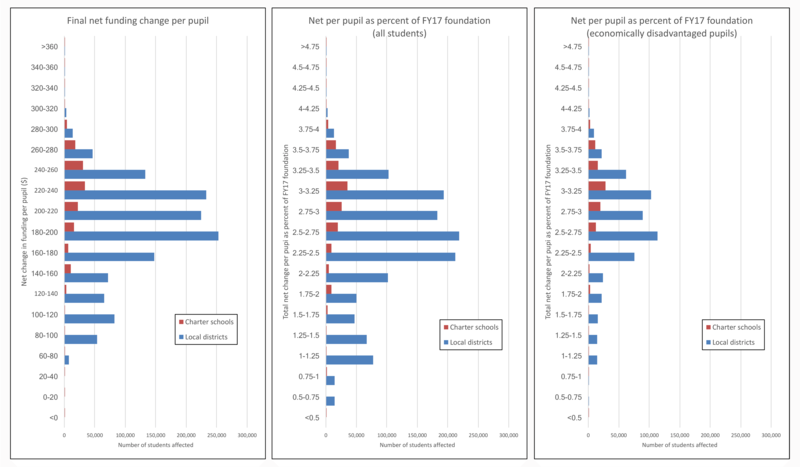 This meant that the actual dollars per student was higher for higher-funded districts than for lower-funded districts - except that "hold harmless" and "out of formula" districts, which are able to raise funds above the state maximum, did not qualify for the at-risk funding at all. Now, all districts will receive the same dollars per eligible pupil, calculated as 11.5% of the weighted average foundation allowance amount (prorated to the extent appropriations fall short of the full amount necessary). Hold harmless and out of formula districts would now be eligible to receive funding for their low-income students, though at only 30% of the level other districts receive. If fully funded, the section would cost some $575 million, meaning districts will receive 86% of the nominal amount. Districts below the state maximum will receive around $777 per eligible pupil, while the newly-eligible districts will receive $233 per economically disadvantaged student. Among other things, the funds may be used to help comply with the "third grade reading" law's requirements. Districts are also required to use a "multi-tiered system of supports" (MTSS) for their students in grades K-8, up from K-3; and districts may use 5% of the funding to pay for relevant professional development. The conference report reinstated part of the governor's proposal to give districts a bonus for each high school student, to help defray the higher costs of running high school programs. Though funded at only half the amount, or $25 extra per high school student, this provision had originally been deleted in the earlier House and Senate versions. Earlier draft budgets had eliminated extra funding for "CEOs" appointed to struggling districts by the State Reform Office. Proposals to fund MDE's "Partnership Model Districts " program, which resembles our own proposal for state assistance to struggling districts , had been left as items for later negotiation. In the final version, SRO funding was eliminated, but the conference report doubled funding for the partnership program compared to the governor's request, allocating $6 million to the initiative. In the aftermath of the fight over closing the state school retirement system (MPSERS), $200 million that had earlier been earmarked to pay for the first year closing costs will now be used to make a one-time payment on unfunded costs of the 2010 early retirement incentives. The budget also includes the now much-smaller cost of changes to the state defined contribution plan, at $23.1 million. Support for career and technical education (CTE) equipment upgrades was funded at a level less than the governor's proposal but more than the earlier draft budgets. The budget also replaces $4 million in lost Federal funding to cover state school data collection, an item not included in earlier drafts. The final, "compromise," budget still does not include funding Gov. Snyder requested to support training on the new mandatory teacher evaluation systems. substantial penalties, 5% of total state aid, for districts which still have certain "prohibited subjects" in their contracts with local teachers - despite the fact that these provisions cannot be legally enforced in any case. All of these provisions, however, can be changed every year during the budget process - which highlights, were it not already crystal clear, the importance of who gets to choose what does and does not make it into the budget.